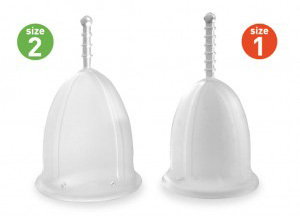 The Si-Bell is a formerlly very common cup which now can be rather difficult to find. It has the common bell shape, but rather than ridges that encircle the cup to provide grip, it has four "veins" that run from the top of the cup to the bottom and have just a gentle texture. It has a long, thin stem with ridges to help with removal. It is made of platinum silicon, which provides better bacteria resistance and longer life than peroxide treated silicone. It comes in two sizes, small and large, which you should choose based on your age, whether you've given birth vaginally, and the amount of flow. It complies with many standards including USP Class VI and FDA.